Disciplined Entrepreneurship will change the way you think about starting a company. Many believe that entrepreneurship cannot be taught, but great entrepreneurs aren’t born with something special – they simply make great products. This book will show you how to create a successful startup through developing an innovative product. It breaks down the necessary processes into an integrated, comprehensive, and proven 24-step framework that any industrious person can learn and apply. Whether you’re a first-time or repeat entrepreneur, Disciplined Entrepreneurship gives you the tools you need to improve your odds of making a product people want. 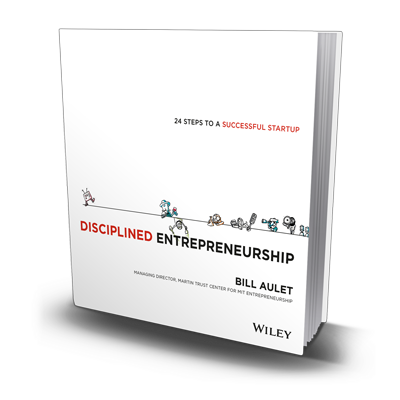 Author Bill Aulet is the managing director of the Martin Trust Center for MIT Entrepreneurship as well as a senior lecturer at the MIT Sloan School of Management. This entry was posted in Books and tagged bill aulet, entrepreneurship, MIT, sloan school of management. Bookmark the permalink.